The role of CD8+ CTL in protection against tuberculosis in human disease is unclear. In this study, we stimulated the peripheral blood mononuclear cells of bacillus Calmette-Guérin (BCG)-vaccinated individuals with live Mycobacterium bovis BCG bacilli to establish short-term cell lines and then purified the CD8+ T cells. A highly sensitive enzyme-linked immunospot (ELISPOT) assay for single cell IFN-γ release was used to screen CD8+ T cells with overlapping peptides spanning the mycobacterial major secreted protein, Ag85A. Three peptides consistently induced a high frequency of IFN-γ responsive CD8+ T cells, and two HLA-A*0201 binding motifs, P48–56 and P242–250, were revealed within the core sequences. CD8+ T cells responding to the 9-mer epitopes were visualized within fresh blood by ELISPOT using free peptide or by binding of HLA-A*0201 tetrameric complexes. The class I-restricted CD8+ T cells were potent CTL effector cells that efficiently lysed an HLA-A2-matched monocyte cell line pulsed with peptide as well as autologous macrophages infected with Mycobacterium tuberculosis or recombinant vaccinia virus expressing the whole Ag85A protein. Tetramer assays revealed a 6-fold higher frequency of peptide-specific T cells than IFN-γ ELISPOT assays, indicating functional heterogeneity within the CD8+ T cell population. These results demonstrate a previously unrecognized, MHC class I-restricted, CD8+ CTL response to a major secreted Ag of mycobacteria and supports the use of Ag85A as a candidate vaccine against tuberculosis. M;-2qycobacterium tuberculosis, the causative agent of human tuberculosis (TB),4 remains a major public health risk world-wide. Estimates suggest that one-third of the world’s population is latently infected with the bacillus, and the disease accounts for 12 million new cases of active disease and 3 million deaths per year (1, 2). The only vaccine currently available for human use against the disease is Mycobacterium bovis bacillus Calmette-Guérin (BCG); however, its efficacy is variable and limited, especially against pulmonary TB (2). The cellular arm of the immune response mediated by Ag-specific IFN-γ-secreting CD4+ T cells has long been established as an essential component of the protective immune response against M. tuberculosis (3, 4, 5, 6, 7, 8). However, more recently, the importance of other T cell populations in protective immunity against TB has come to light. There is increasing evidence in both the murine model of TB infection and human studies that a major role exists for MHC class I-restricted αβ TCR+ CD8+ T cells (9, 10, 11, 12, 13, 14, 15, 16). Ag-specific CD8+ T cells can act as cytokine-secreting cells, producing the type 1 cytokines IFN-γ and TNF-α, which activate macrophage mycobactericidal mechanisms (17); in addition, CD8+ T cells can perform a CTL function, lysing infected cells and releasing bacteria for either extracellular killing, or for uptake by activated macrophages (17). Human CD8+ T cells have been shown to perform both cytokine production and cytolytic effector functions when stimulated with mycobacteria (9, 12, 13, 14, 15). In the murine model, perforin, granzyme, and Fas pathway knockout mice that lack the cytolytic functions of CD8+ T cells appear to be no more susceptible to M. tuberculosis infection than wild-type mice, at least during the early acute infection (18, 19). In addition, the transfer of immunity with CD8+ T cells has been shown to be dependent upon the ability of the CD8+ T cells to secrete IFN-γ (20), and an increase in IFN-γ-secreting CD8+ T cells has been observed in the lungs of M. tuberculosis-infected mice (21, 22). Clearly, CD8+ T cells play an important role in immunity against TB; however, their exact function remains unclear. The specific Ags to which CD8+ T cells respond to are poorly characterized. At present, only three human CD8+ T cell reactive epitopes have been identified, two in ESAT-6 and one in the 19-kDa Ag (23, 24). Strong CD8+ T cell reactivity has also been observed against the 38-kDa protein of M. tuberculosis (15, 25). Murine vaccination experiments have also shown CD8+ T cell reactivity against Ag85A (26) and heat shock protein-65 (27, 28). Previously, we have found human M. bovis BCG-reactive CD8+ T cells to give strong CTL activity against Ag85A (15). In the present study, we have investigated the human CD8+ T cell response to Ag85A to define the epitopes recognized. Ag85A is one of three distinct but highly conserved proteins (85A, -B, and -C) that together make up the Ag 85 complex, a highly cross-reactive Ag found in all mycobacterial species tested so far. 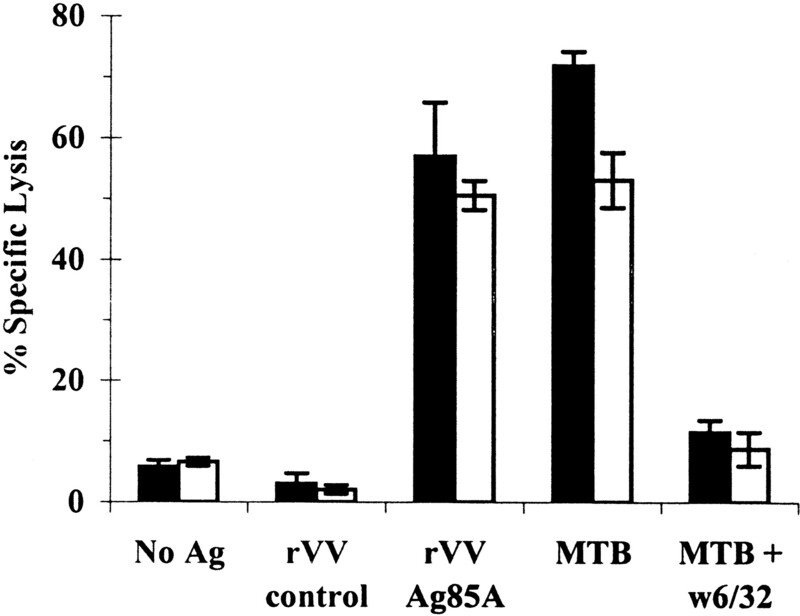 Ag85A is a secreted Ag that constitutes a major portion of the secreted proteins present in the culture filtrate of both M. tuberculosis and M. bovis BCG (29). CD8+ CTL responses have been observed against culture filtrate proteins of both M. bovis BCG and M. tuberculosis (30, 31). Furthermore, the Ag85 complex has been shown to induce good proliferative, IFN-γ, and cytolytic responses in BCG-vaccinated, or M. tuberculosis- and Mycobacterium leprae-infected individuals (15, 32, 33, 34). Mouse immunization experiments have shown plasmid DNA vaccination encoding Ag85A to generate a strong Th1 CD4+ T cell and CD8+ T cell-mediated CTL response in mouse immunization studies (26, 35, 36). In this paper, we describe the CD8+ T cell epitope mapping of Ag85A in healthy BCG-vaccinated donors. M. bovis BCG-stimulated CD8+ T cells were used to screen 33 overlapping 20-mer peptides covering the entire Ag85A protein from M. tuberculosis. Once peptides had been identified as possessing CD8+ T cell reactivity, peptide-specific cell lines were generated and used in cytotoxicity assays to identify HLA restriction of the epitopes. In addition, reactivity of these peptide-specific lines to whole protein expressed by recombinant vaccinia virus (rVV), or live M. bovis BCG and M. tuberculosis infection, was demonstrated. Ten healthy U.K. laboratory donors who had previously received M. bovis BCG vaccination were recruited from the London School of Hygiene and Tropical Medicine. Blood samples were taken after gaining written permission from those individuals participating in the study. Ethical permission was obtained from the Ethics Committee at the London School of Hygiene and Tropical Medicine. Four healthy BCG-vaccinated HLA-A*0201 Gambian donors were recruited from the Banjul Blood Bank, Royal Victoria Hospital, after informed consent was obtained. Ethical permission was given by the Medical Research Council (MRC), The Gambia, Scientific Coordinating Committee, and The Gambia Government/MRC Ethics Committee. Subjects were HLA typed by amplification mutation system (ARMS)-PCR using sequence-specific oligonucleotide primers. The HLA-A*0201-restricted influenza matrix epitope FMP M158–66 (GILGFVFTL) and a total of 33 sequential peptides of 20 amino acids, overlapping by 10 and spanning the complete Ag 85A protein sequence for M. tuberculosis, H37Rv (Sanger Center database: http://www.sanger.ac.uk) were commercially synthesized by Research Genetics (Huntsville, AL). Peptide synthesis was confirmed by HPLC and mass spectrometry profiles and were >80% purity. M. bovis BCG (Glaxo Evans strain; Evans Medical, Leatherhead, U.K.) and M. tuberculosis (H37Rv) were grown to log phase in Middlebrook 7H9 medium (Difco, Detroit, MI) supplemented with Middlebrook ADC enrichment (Difco) and 0.05% Bacto-Glycerol (Difco). Bacteria were harvested and frozen at −70°C. Bacterial counts were determined by counting CFUs either grown on Middlebrook 7H10 agar supplemented with OADC enrichment (Difco) or in liquid 7H9 agar supplemented with ADC enrichment (Difco). Vials were thawed and washed once with RPMI 1640 (Life Technologies, Paisley, U.K.) and sonicated for 10 s in a water bath sonicator (Grant XB2; Fisons, Leicester, U.K.) to disrupt clumps before use. rVV expressing the mycobacterial proteins Ag85A were constructed by Dr. A. Malin as previously described (15). rVV were cultivated by growth in the thymidine kinase-disrupted osteosarcoma cell line 143 (TK−143). Viruses were harvested and purified by sucrose cushion density centrifugation before aliquoting at −70°C. On the day of use, aliquots were thawed and sonicated before use in assays. The human monocyte cell line THP-1 (American Type Culture Collection, Manassas, VA; TIB-202) was maintained in T75 tissue culture flasks (Nunclon, Roskilde, Denmark). The growth medium used was RPMI 1640 supplemented with 2 mM l-glutamine (Life Technologies) and 10% heat-inactivated FCS (Life Technologies). PBMC were isolated from heparanized venous blood by density gradient centrifugation over Ficoll-Histopaque (Sigma, Poole, Dorset, U.K.). Nonadherent cells (NAC) and monocytes were separated by adherence to plastic. Briefly, PBMC were resuspended at 1 × 106 cells/ml in RPMI 1640 and plated at 200 μl/well of a 96-well round-bottom tissue culture plate. Cells were incubated for 1 h at 37°C before NAC were removed by pipetting off the supernatant. Adherent monocytes were then resuspended in culture medium (CM) and incubated at 37°C, 5% CO2 for use as target cells in CTL assays. CM consisted of RPMI 1640 supplemented with 2 mM l-glutamine (Life Technologies), 50 μg/ml ampicillin (Sigma), and 10% autologous plasma. NAC were used for the generation of peptide specific short-term cell lines (STCL). NAC alone were prepulsed with 50 μM peptide for 1 h in a cell pellet and then diluted up to 1 × 106 cells/ml in CM supplemented with 25 ng/ml rhIL-7 (R&D Systems, Abingdon, U.K.) and seeded at 100 μl/well in a 96-well round-bottom tissue culture plate. CM containing 10% Lymphocult-T (Biotest, Solilhull, U.K.) was added to each well at 3- to 4-day intervals. For the generation of M. bovis BCG cell lines, PBMC were aliquoted at 100 μl/well and infected with 2 × 104 bacilli per well. Cells were cultured as for peptide-specific cell lines. Ag-specific CD8+ T cells were prepared by positive enrichment using the MACS system (Miltenyi Biotech, Bergisch-Gladbach, Germany). In brief, PBMC were labeled with CD8 microbeads (Miltenyi Biotech; 20 μl/107 cells) in incubation buffer (PBS/0.5% BSA/2 mM EDTA; 80 μl/107 cells) for 15 min at 4°C. After one washing, step cells were resuspended in incubation buffer (1 ml buffer/107 cells), and enrichment was performed using LS+ columns and the MidiMACS magnet according to manufacturer’s instructions. The resulting CD8+ T cell population was >95% pure as determined by flow cytometric analysis for the surface markers αβ TCR, CD3, CD8, and contamination with CD4 and CD56. Ninety-six-well polyvinylidene difluoride-backed plates (MAIP S 45; Millipore, Bedford, U.K.) were precoated with 15 μg/ml anti-IFN-γ mAb (1-D1K; MABTECH, Stockholm, Sweden) overnight at 4°C. Plates were then washed six times with RPMI 1640 and blocked with RPMI 1640 supplemented with 10% heat-inactivated FCS for 1 h at 37°C. Purified CD8+ T cells from PBMC or STCL were washed twice with RPMI 1640, resuspended in RPMI 1640 supplemented with l-glutamine and 10% autologous plasma, and dispensed at known input cell numbers per well in duplicate wells without additional APCs. In this sensitive ELISPOT assay, efficient presentation of peptide occurs without additional APCs, because CD8+ T cells can present peptide through HLA class I to each other (23, 37). Peptide was added directly to the supernatant at a final concentration of 2 μM, and the plates were incubated at 37°C for 18 h. Cells were then shaken off and the plate washed six times with PBS 0.05% Tween 20 (Sigma). Plates were then incubated for 3 h at 37°C with the second biotinylated anti-IFN-γ mAb (7-B6-1-biotin at 1 μg/ml; MABTECH). A further wash with PBS 0.05% Tween 20 was performed before the addition of a 1:1000 dilution of streptavidin-alkaline phosphatase conjugate (MABTECH) for 2 h. Wells were again washed six times, and 100 μl of chromogenic alkaline phosphatase substrate (Bio-Rad, Hemel Hempstead, Hertfordshire, U.K.) was added to each well. After 30 min, the colormetric reaction was terminated by washing with tap water and the plates were allowed to air dry. After drying, spots were counted by eye. Autologous monocyte-derived-macrophages or the cell line THP-1 were seeded at 10,000 cells/well of a 96-well round-bottom plate and used as target cells in cytotoxicity assays. Target cells were incubated overnight at 37°C in CM (RPMI supplemented with l-glutamine plus 10% autologous plasma for macrophages or 10% heat inactivated pooled human AB serum for THP-1 cell line), loaded with Ag (10 μg/ml peptide; 10:1 (CFU/macrophage) M. tuberculosis; 25:1 (PFU/macrophage) rVV expressing Ag85A; or no Ag), and pulsed with 2 μCi 51Cr. Target cells were washed three times with RPMI and either treated with 5 μg/ml w6/32 mAb (Sigma) or resuspended in CM alone before being used in the cytotoxicity assay. Purified CD8+ T cells were added as effector cells to the 96-well plate at various E:T ratios (50:1, 5:1, 0:1) in a final volume of 100 μl/well and incubated at 37°C for 6 h. Supernatants (50 μl) were harvested, and 51Cr release was measured using a gamma counter. The remaining supernatant was removed and replaced with 100 μl/well 5% SDS (Sigma) for 1 h at 37°C to lyse the remaining cells. Spontaneous release was measured in wells containing target cells alone. The percent specific lysis was calculated by the following formulas: % isotope release = [cpm supernatant/(cpm supernatant + cpm pellet)] × 100; and % specific lysis = [(% isotope release test wells) − (% isotope release control wells)]. Tetrameric complexes were synthesized as previously described (38, 39). Briefly, purified HLA heavy chain and β2-microglobulin were synthesized using a prokaryotic expression system (pET; R&D Systems). The heavy chain was modified by deletion of the transmembrane cytosolic tail and COOH-terminal addition of a sequence containing the biotin-protein ligase BirA (Avidity, LLC, Denver, CO) enzymatic biotinylation site. Heavy chain, β2-microglobulin, and peptide were refolded by dilution. The 45-kDa refolded product was isolated by fast protein liquid chromatography and then biotinylated by BirA in the presence of biotin (Sigma), adenosine 5′-triphosphate (Sigma), and Mg2+ (Sigma). Streptavidin-PE conjugate (Sigma) was added in a 1:4 molar ratio, and the tetramic product was concentrated to 1 mg/ml. Fresh PBMC or peptide-specific STCL were incubated for 30 min at 37°C in staining buffer (PBS with 0.1% BSA and 0.1% sodium azide) containing 3 μl of PE-labeled tetrameric complex. Cells were given one wash in warm staining buffer. Cells were then incubated at 4°C in staining buffer containing saturating amounts of anti-CD8 mAb conjugated to FITC (Becton Dickinson, Mountain View, CA) or TriColor (Caltag, Buckingham, U.K.). In addition, saturating amounts of anti-CD45Ra or CD45Ro Abs (Becton Dickinson) conjugated to FITC were added to certain samples for phenotype characterization. The stained cells were fixed in PBS containing 4% paraformaldehyde. Samples were analyzed by FACS using CellQuest software (Becton Dickinson). Lymphocytes were gated by forward and side angle light scatter; >105 events were acquired. Intracellular cytokine production by PBMC was assessed by three-color flow cytometry. Briefly, cells were stained with tetramer in 100 μl RPMI. Cells were then resuspended into 1 ml CM containing 10% autologous plasma. Cells were stimulated with peptide at 10 μg/ml for 6 h at 37°C. Cytokine secretion was blocked by incubation with 10 μg/ml brefeldin A (Sigma) for the duration of the stimulation. Cells were washed twice in cold PBS and stained for surface CD8 with TriColor-conjugated Ab (Caltag) at 4°C for 30 min in incubation buffer (PBS/0.5% BSA/0.1% Na azide). Cells were washed twice in cold incubation buffer before fixation and permeabilization by incubation for 30 min in FACS Cytofix/Cytoperm solution (PharMingen, San Diego). Cells were washed in 1× PermWash solution (PharMingen). Staining for intracellular cytokine was performed in 1× PermWash with FITC-conjugated mAb against IFN-γ, or IL-4 (PharMingen) for 30 min at 4°C. Cells were then washed in PBS and analyzed using CellQuest software on a FACScan or FACScalibur (Becton Dickinson); >105 events were acquired for each sample. Previous studies have demonstrated that CD8+ CTL are elicited by exposure to M. bovis BCG and that these cells recognize Ag85A (15). In this study, we employed the same approach using PBMC from BCG-vaccinated individuals to generate M. bovis BCG-specific cell lines and to isolate the CD8+ T cells. PBMC from 10 healthy BCG-vaccinated donors were stimulated for 14 days with live M. bovis BCG in the presence of IL-2 and IL-7 to produce BCG-reactive STCL. CD8+ T cells were purified from the lines by MACS-positive selection and used in a sensitive IFN-γ ELISPOT assay to detect single cell cytokine production. The CD8+ T cells were stimulated overnight with one of the 33 20-mer overlapping peptides from Ag85A to determine which peptides contained CD8+ T cell-reactive epitopes (Fig. 1⇓). IFN-γ ELISPOT responses of BCG STCL to overlapping 20-mer peptides from Ag85A. One representative HLA-A*0201-positive BCG-vaccinated donor (A) and one nonresponder (B) are shown; five donors were tested per group. Results are expressed as the number of SFC per 105 CD8+ T cells. IFN-γ production was observed in response to peptides 5, 24, and 25 (Fig. 1⇑). Closer sequence analysis of these three peptides revealed HLA-A*0201 binding motifs within the core region of the peptides (Table I⇓). Thus, the HLA-A*0201 motif was identified as the active region within the peptide 5, because no reactivity was observed against the flanking peptides 4 and 6. Similarly, equivalent responses to both peptide 24/25 and not the flanking peptides indicated reactivity to the overlapping 10 amino acids congruent with the HLA-A*0201 motif. T cell lines reactive to peptide 5, or peptides 24/25, were then tested for reactivity with 9-mer peptides containing the HLA-A*0201 binding motif, and both 9-mer and 20-mer peptides induced equivalent responses. A molecular tissue type of the five donors who responded to the peptides revealed the donors all to be HLA-A*0201 (Table II⇓). To determine the frequency of circulating peptide-specific CD8+ T cells, fresh CD8+ T cells from five HLA-A*0201 donors were assayed in an ex vivo ELISPOT assay. The mean frequency of circulating P48–56-reactive CD8+ T cells was 1/20,000 (range 1/18,519–1/22,727) compared with 1/23,810 (range 1/20,833–1/27,777) P242–250-specific cells. 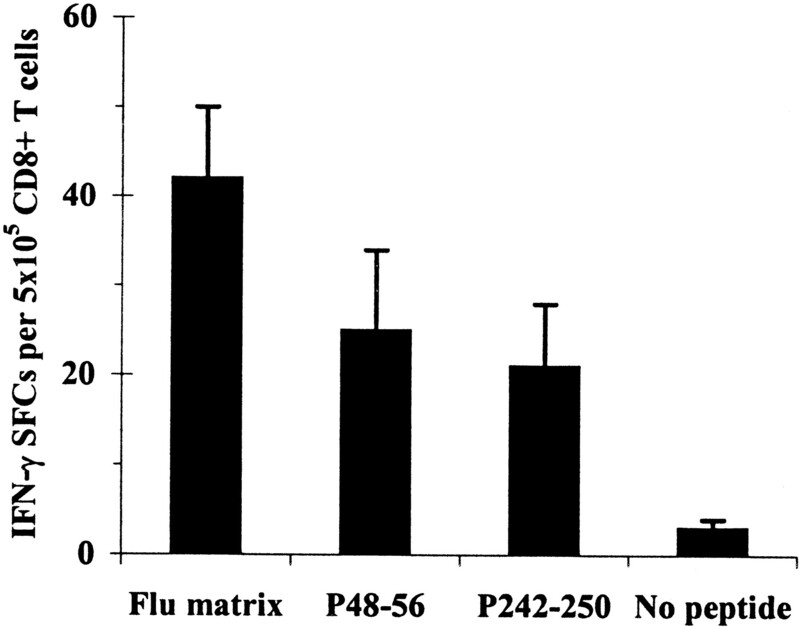 The frequency of P48–56- and P242–250-specific IFN-γ spot-forming cells (SFCs) was of the same order of magnitude as circulating cells specific for the HLA-A*0201-restricted influenza matrix epitope FMP M158–66 (Fig. 2⇓). Enumeration of circulating peptide-specific effector cells from the peripheral blood of five HLA-A2 healthy BCG-vaccinated donors. A total of 5 × 105 CD8+ T cells were stimulated overnight with either FMP M158–66, P48–56, P242–250, or no peptide in an ELISPOT assay for single cell IFN-γ production. Results are expressed as the mean number of SFC per 5 × 105 CD8+ T cells. To confirm the HLA restriction of these two epitopes, CD8+ T cell lines were established by a 14-day culture of PBMC in the presence of either P48–56 or P242–250. The CTLs elicited were assayed for their cytotoxic activity against the peptide-pulsed human HLA-A2-, -A9-, -B5-restricted monocyte cell line THP-1. Peptide-specific HLA-A2-restricted CTL activity was observed by both P48–56- and P242–250-specific CD8+ T cells (Fig. 3⇓). As seen in Fig. 3⇓A, P48–56-stimulated CD8+ T cells showed strong CTL activity against THP-1 cells pulsed with P48–56 (76.4 ± 4.3% specific lysis at 50:1 E:T ratio), but no significant lysis against either FMP M158–66 or P242–250 pulsed targets (<10% specific lysis at 50:1 E:T ratio). Conversely, as shown in Fig. 3⇓B, P242–250-reactive CD8+ T cells showed potent CTL activity against P242–250-pulsed THP-1 cells (76.8 ± 7.0% specific lysis at 50:1 E:T ratio), but no significant lysis against FMP M158–66 or P48–56 pulsed target cells. The cytolytic activity of these Ag-specific CD8+ CTLs was completely inhibited by the addition of an anti-MHC class I mAb w6/32. Blocking with this mAb reduced the levels of lysis to <10%. The addition of an isotype-matched control mAb (IgG2a) had no significant effect upon lysis of target cells (data not shown). These results demonstrate that the peptide-specific CD8+ T cell response is HLA class I-dependent and, in the case of the donors matched only at HLA-A2 with the target cell line, HLA-A2 restricted. HLA-A*0201 restriction of the CD8+ T cell response against P48–56 and P242–250. STCL were generated against P48–56 (A) and P242–250 (B). CD8+ T cells were purified and assayed in a standard 51Cr release CTL assay against THP-1 cells loaded with peptide and pretreated with either no mAb or anti-HLA A, B, C (w6/32). Treatment of THP-1 with an isotype control mAb IgG2a had no significant effect on the levels of lysis mediated by CD8+ T cells. Results are expressed as mean % specific lysis (±SD) for five donors. To examine the ability of peptide-specific CTLs to recognize endogenously generated epitopes, autologous monocyte-derived macrophages were infected overnight with either M. tuberculosis H37Rv bacilli, or rVV expressing the whole Ag85A protein. Fig. 4⇓ shows that P48–56- and P242–250-specific CTLs are able to recognize and lyse M. tuberculosis and rVV85A-infected macrophages. The lysis observed against M. tuberculosis bacilli was shown to be MHC class I-dependent by blocking with mAb w6/32. These results demonstrate antimycobacterial activity of peptide-specific CTLs by the recognition of endogenous generated peptide in a MHC class I-restricted manner. Peptide-specific CD8+ T cells recognize M. tuberculosis via MHC class I. P48–56 (▪) and P242–250 (□)-specific CD8+ T cells were tested for cytotoxicity against autologous macrophages infected overnight with either M. tuberculosis H37Rv or rVVAg85A. M. tuberculosis-infected macrophages were pretreated with either no mAb or anti-HLA-A, B, C (w6/32) mAb. Results show mean % specific lysis (±SD) for five donors. To determine whether the observed recognition of P48–56 and P242–250 was unique to U.K. BCG vaccinees, four HLA-A*0201 BCG vaccinated donors from The Gambia were tested for peptide specific responses. STCL were generated against both peptides and were tested for CTL activity against autologous peptide and M. tuberculosis-infected macrophages. As shown in Fig. 5⇓, peptide reactivity was observed in all four of the Gambian donors. Gambian BCG vaccinees respond to P48–56 and P242–250. P48–56 (♦) and P242–250 (⋄)-specific CD8+ T cells were tested for cytotoxicity against autologous macrophages loaded with either peptide or infected overnight with M. tuberculosis H37Rv. Results show individual donors and mean lysis (). The Ag85A HLA-A*0201 epitopes were used to synthesize tetramer complexes able to stain the peptide-specific CD8+ T cells from PBMC and cell lines. To determine the specificity of each tetramer, fresh blood PBMC from an HLA-A*0201-negative BCG vaccinee were stained with each tetramer; <0.01% of CD8+ T cells stained with either tetramer. In addition, PBMC from three HLA-A*0201 BCG-vaccinated donors were used to generate FMP M158–66-specific T cell lines; tetramer staining was then performed using the Ag85A tetramers: again, <0.01% of CD8+ T cells stained positive for either tetramer. Fresh blood tetramer staining revealed that ∼1/3500 circulating CD8+ T cells were specific for P48–56 or P242–250, so that at least 1/1750 cells are specific for Ag85A as a whole (Table III⇓). The frequency of circulating peptide-specific CD8+ T cells was ∼6-fold higher when detected by tetramer compared with ELISPOT (Table III⇓). After 10 days of culture with peptide, the frequency of tetramer-specific T cells increased to ∼1/20 CD8+ T cells (Fig. 6⇓). Tetramer staining of peptide-specific CD8+ T cells. Ten-day P48–56 (left) and P242–250 (right) STCL were generated from three responders and stained with tetramers to determine the frequencies of peptide-specific cells. FACS plots are for one donor representative of three. To determine the phenotype of the tetramer-specific CD8+ T cells, fresh blood PBMC from three HLA-A*0201 BCG-vaccinated donors were stained for surface CD45Ra/CD45Ro expression in addition to intracellular IFN-γ or IL-4 production. As shown in Table IV⇓, the majority (70–85%) of P48–56-specific CD8+ T cells expressed the CD45Ro isoform of CD45, indicative of a memory-like phenotype. In addition, as shown in Fig. 7⇓ and Table IV⇓, ∼20% of tetramer-specific CD8+ T cells produced IFN-γ; however, no significant IL-4 was found. Phenotypic analysis of HLA-A2/GLPVEYLQV-specific CD8+ T cells. 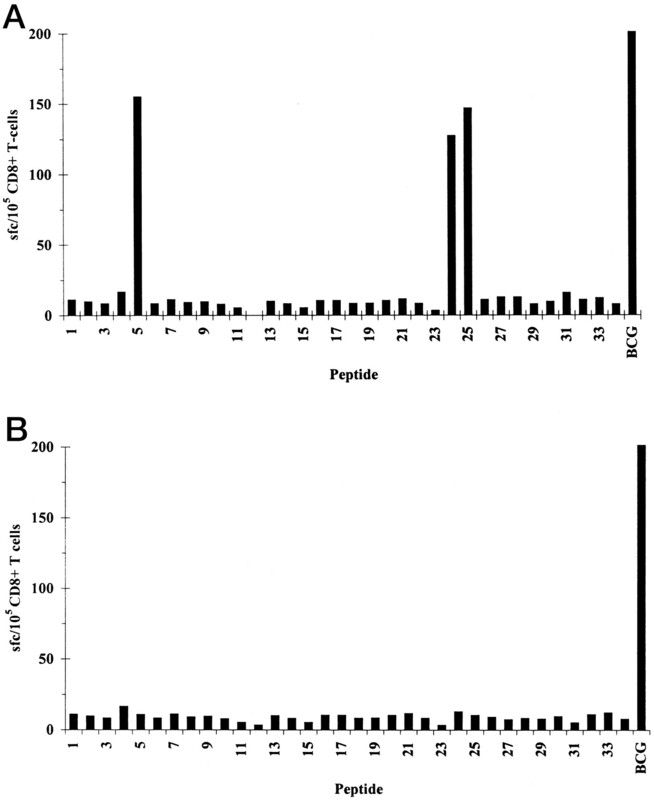 Graphs represent dot plots of two-parameter FACS analysis from one BCG-vaccinated peptide responder representative of three donors tested. PBMC were stained with HLA-A2/GLPVEYLQV tetramer (PE-conjugated, y-axis) alone (A), and Ab specific for IFN-γ (B) (FITC-conjugated, x-axis). Cells were gated progressively on the basis of forward vs side scatter, and CD8 staining; >50,000 cells are included in each gate. 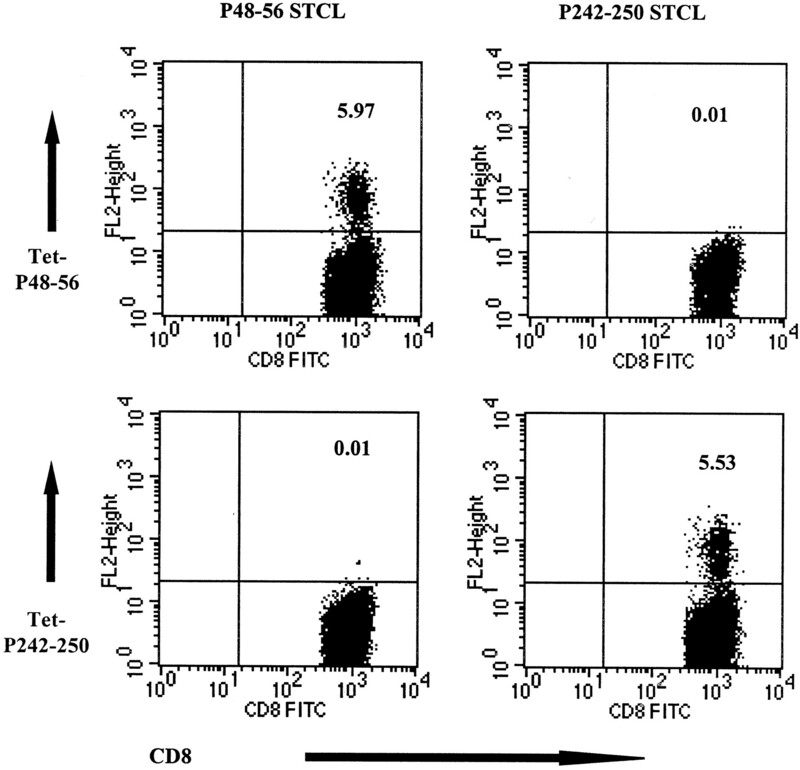 The percent frequency shown in the upper-right quadrant refers to the percentage of tetramer-positive CD8+ T cells (A) and the percentage of tetramer-reactive CD8+ T cells that stain with the relevant phenotypic marker (B). We have previously demonstrated an Ag85A-specific CD8+ CTL response by BCG-reactive T cells in healthy subjects who have received BCG vaccination as young adults, suggesting that this mycobacterial-secreted Ag may be an immunodominant CD8+ T cell Ag (15). In the present study, we use the highly sensitive ELISPOT assay and overlapping peptides spanning the whole of Ag85A to identify two human HLA-A*0201-restricted CD8+ T cell epitopes. The activation of CD4+ T cells has been known for some time to be important for protection against TB; however, there is now mounting evidence from animal models that CD8+ T cells may also be required (10, 11). Nevertheless, the existence of CD8+ T cells specific for M. tuberculosis in human disease has only recently come to light (9, 10, 11, 12, 13, 14, 15). As such, only three human CD8+ T cell epitopes have been identified within M. tuberculosis-specific proteins: two within the secreted protein ESAT-6 (23) and one within the 19-kDa protein (24). At present, the only available vaccine against TB is the live attenuated M. bovis BCG, which is fully protective in some studies and completely ineffective in others (40). The same vaccine is also the benchmark for protection in animal models of TB where no experimental vaccine has yet proven to be superior. A clearer understanding of how BCG works, or a way to dissect out which of the multiple responses elicited by this vaccine are important, would be of enormous benefit in understanding what protective immunity entails. Unlike the more focused “peptide-based” approach, here, we use the whole live BCG organism to restimulate T cell reactivity from naturally primed individuals. The use of the intact bacillus enables identification of Ags that are preferentially immunogenic as well as those that are processed and presented through a natural route. The data strongly suggest that, of the many proteins secreted during an early infection, Ag85A is at least one that is readily presented through HLA class I. 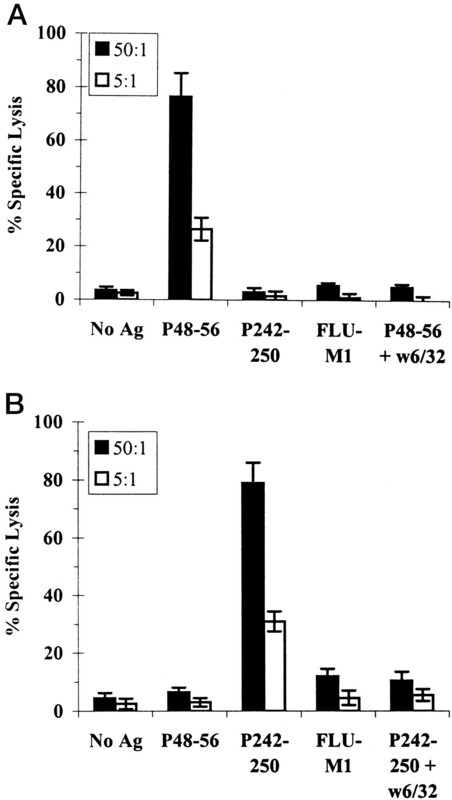 The fact that both of the Ag85A CTL epitopes were presented by macrophages within 24 h of an in vitro infection with M. tuberculosis shows that the microbial secreted Ag is rapidly processed and presented through HLA-class I as well as being immunogenic in M. tuberculosis or M. bovis BCG-infected macrophages. Of the two epitopes identified, among available sequences, P242–250 is specific for Ag85A of M. tuberculosis and M. bovis, whereas P48–56 is also found in Ag85B, Ag85C proteins of M. tuberculosis, and in Ag85A sequences of a number of other mycobacteria, including M. bovis, M. paratuberculosis, M. avium, and M. leprae (http://www.sanger.ac.uk). It is therefore highly probable that the P48–56 CTL epitope will also be conserved in mycobacteria, where the Ag85 complex proteins are as yet unsequenced. The cross-reactive nature of the P48–56 epitope offers the potential for CTL responses to be primed or boosted through natural exposure to environmental bacilli. Of particular significance was the finding that P48–56- and P242–250-specific CTL were able to recognize and lyse macrophages infected in vitro with M. tuberculosis. The response is therefore likely to have some functional importance in the immune response against infection with the pathogen. Despite quite diverse environmental and genetic backgrounds, groups of HLA-A*0201 individuals from both Britain and The Gambia responded to the Ag85A CTL epitopes that we describe. 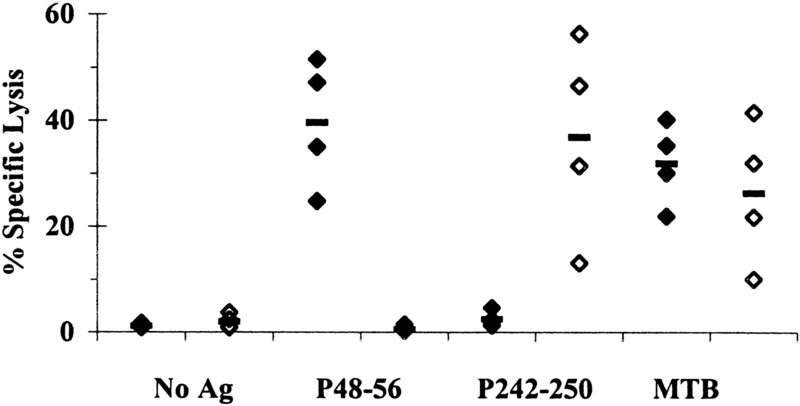 Together these data demonstrate that Ag85A CTL epitopes are naturally primed in vivo and that these are likely to be common in different population groups. Studies by ELISPOT, to investigate the frequency of Ag85A peptide-specific CD8+ T cells in circulation ex vivo, revealed a frequency of T cells comparable to that of the immunodominant HLA-A*0201 epitope of the influenza virus matrix protein. Because none of the individuals had current influenza virus or clinical mycobacterial disease, it is likely that a proportion of these cells possess an immediate effector or memory cell phenotype (23). The number of peptide-specific CD8+ T cells is remarkably high considering that these cells were likely to have been primed by BCG vaccination 10–30 years earlier. When M. bovis BCG-specific lines were established, the frequency of peptide-specific CD8+ T cell epitopes increased ∼10- to 20-fold, demonstrating the existence of highly effective CD8+ T cell memory populations. The identification of CTL epitopes allowed the formation of peptide-MHC tetrameric complexes that stain epitope-specific CTL directly. These are the first bacterial-derived peptide tetramers constructed to be used in the human system; all the previous studies with human cells have used tetramers containing tumor or viral peptide epitopes (37, 38, 41, 42, 43, 44, 45, 46, 47, 48, 49, 50, 51, 52, 53). Interestingly, higher frequencies of peptide-specific CD8+ T cells were seen by tetramer staining when compared with ELISPOT frequencies. Detection of peptide-specific CD8+ T cells using such tetramer complexes is not dependent on T cell function, and these cells do not all secrete IFN-γ. Previous studies have also found higher frequencies of virus- and tumor-specific CD8+ T cells by tetramer when compared with other methodologies, such as limiting dilution or ELISPOT (44). The different estimates of epitope-specific T cell frequencies obtained using ELISPOT and tetramer staining suggest that the “memory pool” of Ag-specific T cells within PBMC is functionally heterogeneous. In the present study, tetramer-specific CD8+ T cells were identified in both the peripheral blood and Ag-specific cell lines, and marked increases in frequency were obtained following stimulation with peptide in vitro. Ex vivo staining of tetramer-specific CD8+ T cells showed the majority of these cells to be CD45Ro-positive, indicative of a memory phenotype. Further studies with the tetrameric complexes will be invaluable to monitor alteration in the frequency of Ag-specific CD8+ T with differing functional phenotypes in studies following M. tuberculosis infection, BCG vaccination, and for testing new vaccines. Ag85A is a major secreted Ag that is present at a high concentration in mycobacterial culture filtrate proteins (29) and to which CD8+ CTL activity has been observed in the mouse (30, 31). Ag85A is reported to induce proliferative and IFN-γ responses by Th1 CD4+ T cells in both human and murine models (32, 33). It was therefore of particular interest to assess the proportion of circulating CD8+ T cells that would recognize peptides from Ag85A. The data obtained to date suggest that as many as 1 in 1000 circulating CD8+ T cells may respond to this naturally secreted Ag, which is capable of eliciting classically restricted CD8+ CTL in humans. Furthermore, vaccination of mice with plasmid DNA encoding Ag85A will induce CD8+ T cells specific for MHC class I-restricted epitopes within Ag85A and confer protection against M. tuberculosis challenge (26, 35, 36). Other groups have shown that heat shock fusion proteins and soluble Ags from M. tuberculosis can be presented via the MHC class I pathway (54, 55). However, the means by which Ags, from a bacteria which has been shown to reside within the phagosome (a site inaccessible to the MHC class I presentation pathway) are presented to CD8+ T cells is unclear (56, 57). However, recent evidence showing phagosome permeability of infected macrophages and the identification of a M. tuberculosis hemolysin suggest possible mechanisms for presentation to CD8+ T cells through diffusion of Ags into the cytosol (58, 59). In conclusion, we found that Ag85A-specific CTL are present at high frequencies in healthy individuals, both in Britain and in The Gambia, identifying frequent responses to conserved epitopes. At least one of the epitopes identified is found in environmental mycobacteria, which suggests the response could be maintained by such exposure. Only a minority of the CD8+ T cells-specific for the epitopes identified using tetramers released IFN-γ in ELISPOT and FACS assays suggesting substantial functional heterogeneity within these CD8+ T cell populations. Finally, we show that these CTL were able to recognize and lyse macrophages infected in vitro with a live MTB infection. Cumulatively, these and other murine vaccination data (26, 35, 36) strongly support a role for Ag85A in the development of an improved vaccine against TB. We thank Dr. Assan Jaye for tissue typing the Gambian donors. ↵1 This work was supported by a grant from the European Commission (IC 18∗CT 970236) and the Wellcome Trust. S.S. is the recipient of a Medical Research Council GlaxoWellcome Collaborative Studentship (G78/5415). M.K. is supported by a GlaxoWellcome Link Fellowship. A.H. is a Wellcome Trust Research Fellow. ↵2 S.M.S. and R.B. contributed equally to this work. 4 Abbreviations used in this paper: TB, tuberculosis; BCG, bacillus Calmette-Guérin; rVV, recombinant vaccinia virus; ELISPOT, enzyme-linked immunospot; STCL, short-term cell lines; NAC, nonadherent cells; CM, culture medium; SFC, spot forming cells.